The recent International Conference on Communication in Healthcare (ICCH) brought together researchers, teachers, practitioners and policy makers from around the world to explore and to improve all aspects of communication in healthcare. 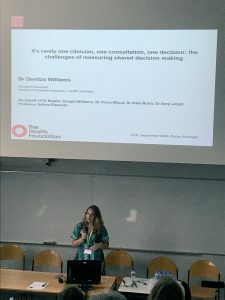 This was a great conference for our researchers at the Division of Population Medicine, the Centre for Trials Research, and PRIME Centre Wales, who focus on decision-making in health to share our findings, to discover best practices and innovations in the field and to network with colleagues from around the world (I had some fascinating conversations with colleagues from as far as Australia, new Zealand and the USA). An added bonus was that the conference was held in the beautiful and historic world heritage city of Porto in Portugal, located alongside the Douro river, known for its stately bridges, architecture and of course Port wine! The conference was packed full of fascinating presentations focusing on shared-decision making (SDM), communication in cancer care, teaching communication skills, health promotion and intercultural and multidisciplinary communication. The Centre for Trials Research, the Division of Population Medicine and PRIME Centre Wales have a track record of patient-centred care and SDM research. 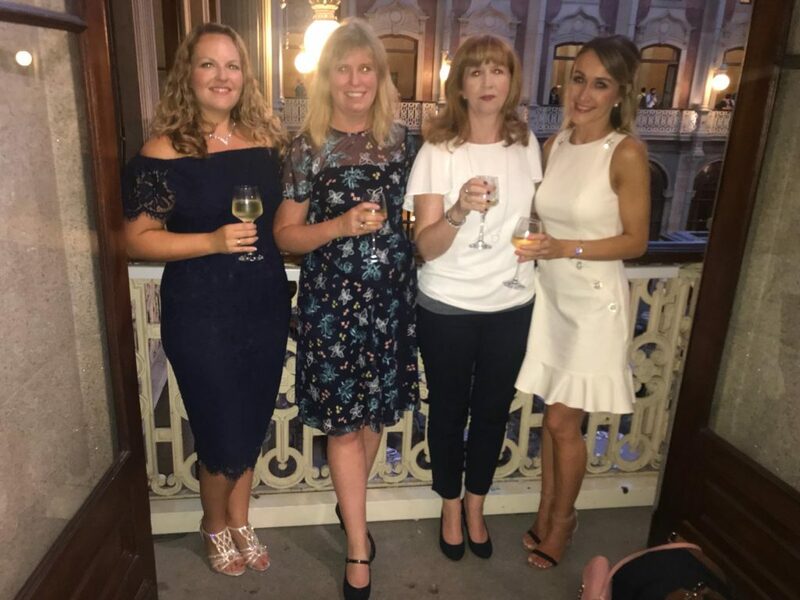 The PRIME leads for patient-centred care, Dr Fiona Wood and Dr Natalie Joseph-Williams, as well as Victoria Shepherd (NIHR doctoral research fellow) and I (Dr Denitza Williams, Research Associate) represented Cardiff University, School of Medicine at the event. Victoria Shepherd and I presented on Sunday the 2nd of September. Victoria talked about family members experiences of decision-making for research involving others who lack capacity to consent. I reflected on the challenges of measuring SDM in real-life clinical practice and the impact this may have on implementation of SDM. Fiona Wood and Natalie Joseph-Williams presented on Monday the 3rd of September. 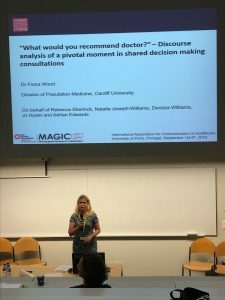 Fiona discussed findings of a discourse analysis focusing on when patients ask a doctor for their treatment recommendation during an SDM encounter. 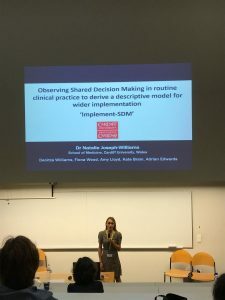 Natalie presented a new descriptive model of SDM derived from observing SDM in clinical practice. Victoria also presented a poster discussing the written information provided to representatives of patients lacking capacity to consent to research. We were very proud when we found out that Victoria had won the research prize for her poster! 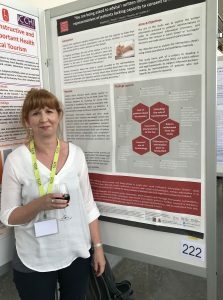 There were many memorable moments for me as a researcher passionate about improving communication between patients and health professionals, and in particular relating to women’s health. Throughout the conference we often debated the definition of SDM, as well as whether it can actually ever be truly captured by any of the current measurement tools. However, a phrase that I will never forget is ‘Lubrication for my soul’. This phrase was repeated throughout the plenary session delivered by Meg Gaines. Meg was diagnosed with ovarian cancer when her children were only six months and three years old and she was told she only had months to live, absolutely devastating. She remarkably fought for pioneering treatment and survived. She spoke candidly and openly about her journey as a gynaecological cancer patient on the brink of death, and how throughout her ordeal she was desperate for health professionals to see her as a ‘whole’ person and not a sum of anatomical parts. Hence, she repeatedly used the phrase ‘I need lubrication for my soul, not my body’. This session really made me reflect on the need for multi-disciplinary care and research. We need to think of patients as whole people and reflect this in practice and research. Our working group specialising in patient centred care and SDM will continue our research focusing on SDM. We are planning to have a number of new publications released soon. Victoria Shepherd is continuing her PhD Fellowship focusing on proxy decision making for individuals who lack capacity to consent to research. Victoria Shepherd next to her award winning poster! Dr Natalie Joseph-Williams presenting at ICCH 2018. Dr Denitza Williams presenting at ICCH 2018. Dr Fiona Wood presenting at ICCH 2018.